Get notified when Carolina Hurricanes tickets are available! The Carolina Hurricanes are a professional American ice hockey team out of Raleigh, North Carolina. 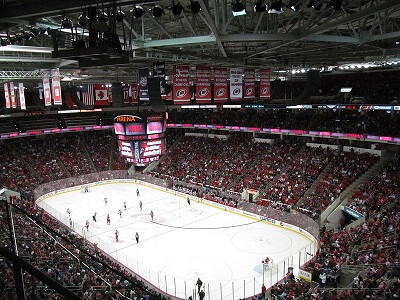 Competing in the National Hockey League, the Carolina Hurricanes play their home games at the PNC Arena which has a seating capacity of 18,680. The Carolina Hurricanes had, as a team, the most wins in a season from 2005-2006, as well as the most points in a season in the same year. They won their first Stanley Cup in 2006. If you would like to be a part of the action at a game near you or at home, follow the links above to get your very own Carolina Hurricanes tickets.